SAW046473 SCOTLAND (1952). Aberdeen, general view, showing John Fleming and Co. Ltd. 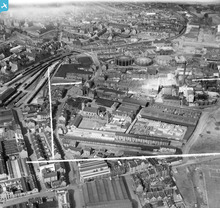 Timber Yard, St Clement Street and Aberdeen Gas Works. An oblique aerial photograph taken facing north-west. This image has been produced from a crop marked negative. Title [SAW046473] Aberdeen, general view, showing John Fleming and Co. Ltd. 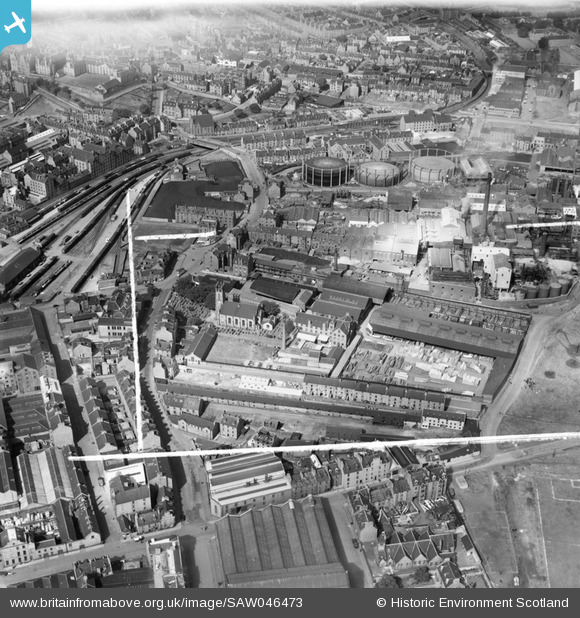 Timber Yard, St Clement Street and Aberdeen Gas Works. An oblique aerial photograph taken facing north-west. This image has been produced from a crop marked negative. Totally wrong location info for: this (SAW046473), SAW046474 and SAW046475 Description fits the picture 'Aberdeen industrial', but not location "Aberfoyle". They're in the same flight as e.g. SAW046468 which (seem to) have a correct location. Don't know where the Aberfoyle info came from. I'll move the locations to an approximate place. OK so it appears that users can't change the position if the image already has a location set. (The location dialog pops up, and is text say to >>click "Change position".<< but there's only a "Close" button.